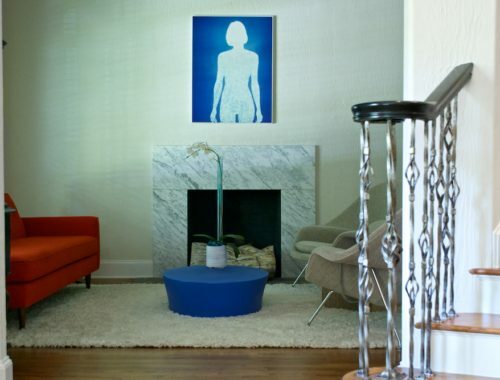 In my experience, art is the single most important decorative element in a home. It tells the story of a home’s residents better than just about anything else can. Generic, unconsidered art sells that story short, in my opinion, and makes a room feel impersonal. But thoughtfully chosen art – the kind that is unique and genuinely elicits an emotional response – that kind of art brings a space to life! 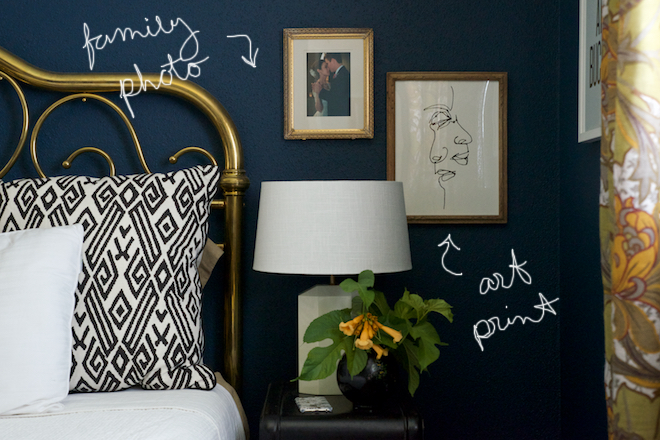 Cost is too often the excuse for not having meaningful art in the home. So, today I’m going to set the record straight and take you on a tour of our Walker art collection to demonstrate seven different ways that you can acquire great art at an affordable price. Yeah, yeah, yeah. You knew I was going to say “DIY”. Typical. But it’s still a great option! For our fifth wedding anniversary, David and I took on a small art project instead of going out. Not only was it a fun experience but we had something truly special to show for it afterwards. Maybe our pieces aren’t masterfully executed, but they’re special to us and completely one of a kind! 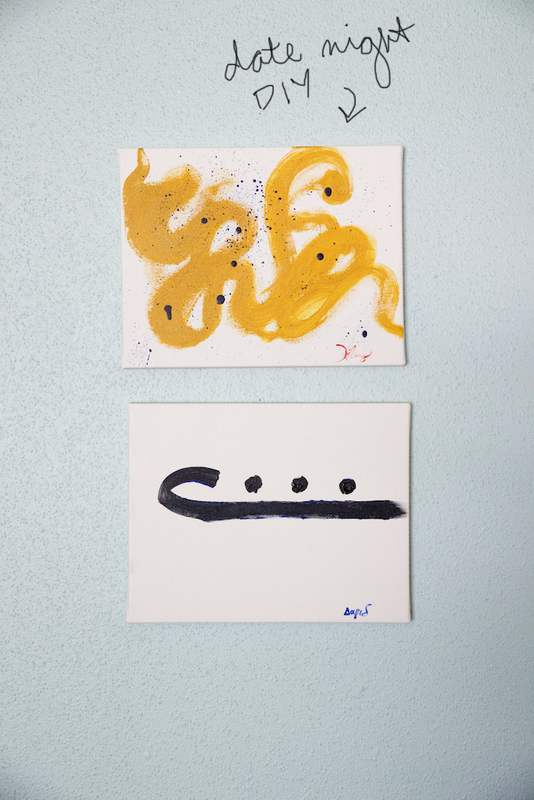 And it only put us back the cost of two small canvases, acrylic paints and a few brushes from our local craft store. 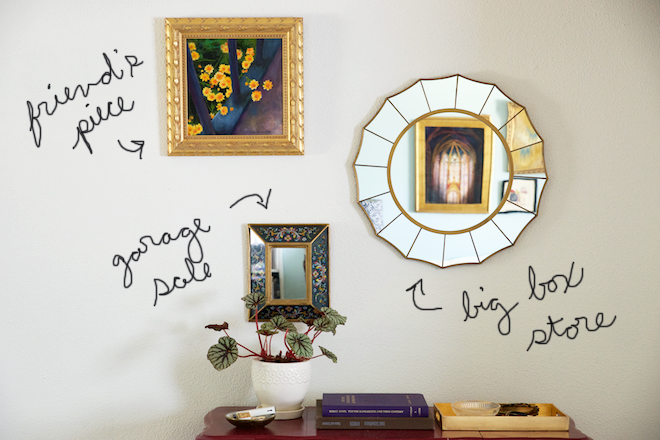 If you’re not artistically inclined, then consider this alternative to the DIY. 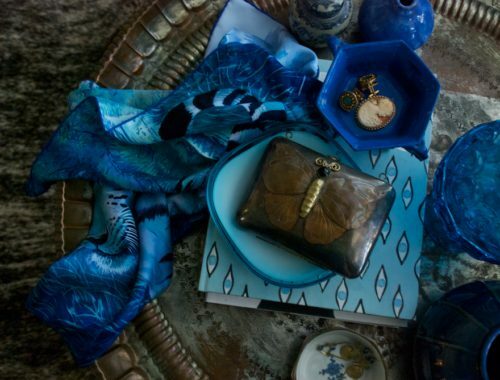 Find a piece of fabric that you love – it could be a silk scarf, vintage weaving or simply a patterned favorite from your local craft store (mine, in the top photo, was an old upholstery sample from my college days studying interior design) – wrap it over a piece of cardboard and frame it. It will add great variety to a gallery wall too. Thrift stores, garage sales, flea markets and estates sales. 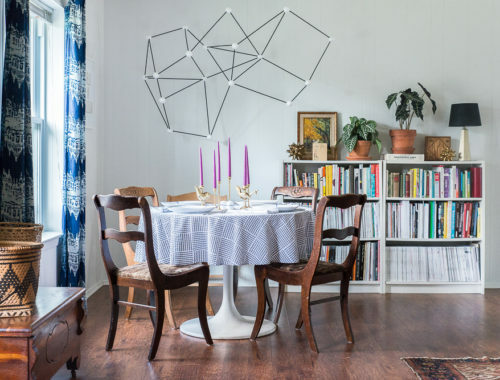 If you have the patience to wade through all the junk for that hidden gem, then this can be an awesome method for sourcing original artwork for your home. I have found countless treasures this way. Case in point, the pen illustration of the bull and bullfighter in our living room. Found for five bucks at an estate sale! And it’s completely original and hand drawn. Let me tell ya, that was a good day. If you’re lucky enough to have an artist as a friend, then this option can be a real win, win for everyone involved. Mine your own personal skills to see what kind of service you can offer in exchange for a piece of their artwork. Maybe it’s help with accounting, a full house cleaning or simply a few days of free baby sitting. Whatever it is, be creative and find a swap that makes everyone happy. Having art in your home that was created by someone you know and love is exceptionally cool. Another great source for original art is old class work. If you’re a closet pack rat like me and have trouble throwing away old school projects, then you probably have a portfolio of sketches and drawings stashed somewhere in the garage from that random art class you took back in college. 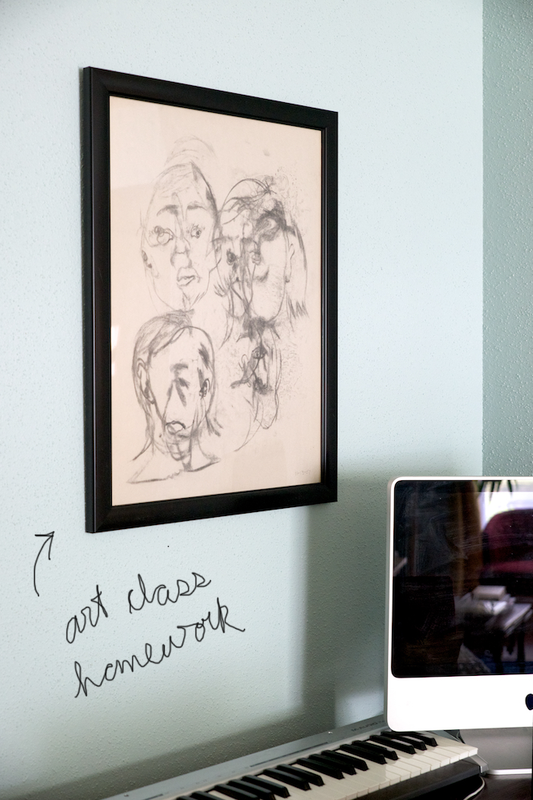 That was the case with this blind continuous line charcoal that we framed and hung above David’s desk. It’s just wacky enough that it works! The more abstract, the better, in my opinion. I’m not the biggest fan of using family photos as artwork around the house. It’s just too easy to go overboard. But the right photo in the right place can be really sweet. My advice… choose carefully, use sparingly. For those that would prefer to avoid picking through dusty thrift stores or concocting amateur DIYs, this one is for you. Purchasing an art print can be a much less expensive alternative to buying original art and an infinitely more customizable and convenient than shopping second-hand. But shop wisely. Not all art prints are created equal! (i.e. please don’t buy your art at Bed, Bath and Beyond). The folks at Minted – a really cool online market place for prints by independent artists – kindly contributed the print above to a very lonely corner of our bedroom. But with their help, I found exactly what I wanted! Nestled into my worn-in spot on the sofa, I scoured the Minted marketplace from the convenience of my computer. I narrowed my search by category, color and orientation and then customized my frame and print size once I found the piece I liked – “Point of View” by Renee of R studio. So, what have I missed? What other methods of curating quality art collections do you recommend? 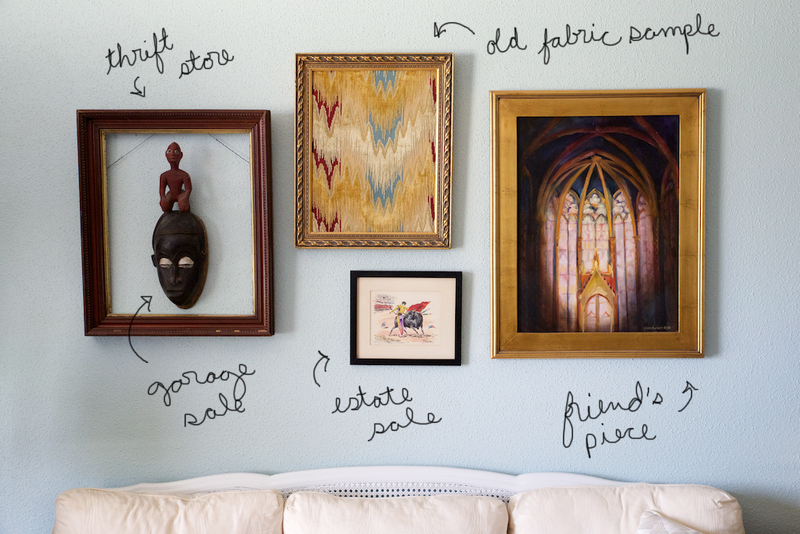 *Big thanks to Minted for contributing the “Point of View” art print for this post. UH OH. I may have gone overboard on family photos! I think a “family tree” style gallery wall of family photos is perfectly fine. And an interesting conversation starter. A million pictures of the same family members strewn all over the house is something else. I’ve also found the handcrafted papers in art supply stores to be gorgeous enough to frame. They’re intricate, fairly large and max out at around $10 a pop. Great idea, Arianna!! I’ll have to try that. I’ve recently been going through my children artwork that people told to trash, so glad I didn’t.